When FullStory is deployed on your site, it's possible that your script is deployed successfully, but that recording is being blocked by FullStory's servers. When this happens, you'll get a numeric reason_code as to why it was blocked. 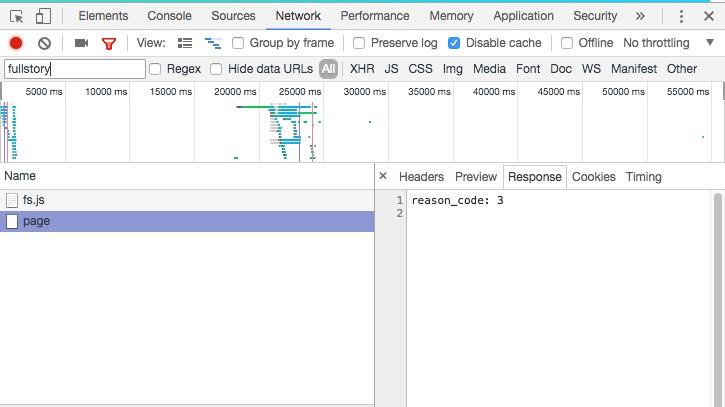 To test this, load the page in question with Chrome's Network developer tools open. If you search for fullstory, you should see a request to page. If recording is successful, you'll get an HTTP status code of 200 in return. If recording is blocked, you'll get a 202 status code in return. Click on the name of the request and then choose the Response tab to see the reason_code. 1 Account does not exist Install the recording script again to make sure you have the correct org. 2 Account disabled The account has been disabled. Contact us to learn more. 3 Over quota You've exceeded your session quota. See What happens if I hit my quota before the end of the billing cycle? 4 Domain Filter You've blocked this particular domain. See Can I disable recording for a specific domain? 5 IP Filter You've blocked this particular IP address. See Can I block unwanted sessions by IP address or User-Agent or bot? 6 User Agent You've blocked this particular User Agent. See Can I block unwanted sessions by IP address or User-Agent or bot? 7 Geography You've blocked this particular geolocation. See Can I block or allow session recordings based on geography? 8 Traffic Ramping If you have a large quota, we gradually ramp up your traffic level as you get started. Contact us is you believe this is affecting you. 10 Opt Out Cookie The user has globally opted out from being recorded. 11 Invalid Recording Script The recording script on your site is outdated. Re-install the recording script from your account settings page. 12 User actively being deleted You've deleted this user from FullStory, and FullStory will block recording while the user is being deleted. See How do I delete a user?